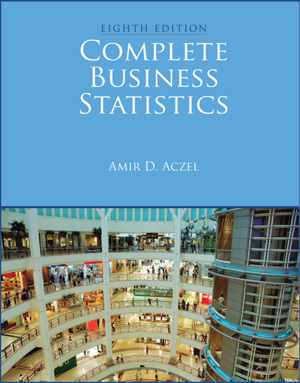 An effective business statistics textbook helps students understand how to think statistically while providing a statistical tool kit that they can use for ultimately solving the applications, and making the business decisions, that they will subsequently encounter in their careers. In order to provide a focus on business applications, many books “cut corners” on mathematical rigor and correctness. Complete Business Statistics does not make this trade-off; instead, it provides a strong focus on business applications while always maintaining a rigorous, mathematically correct presentation and explanation. Providing a large number of high quality, interesting and engaging practice problems is at the heart of any quantitatively-oriented textbook. For that reason, having an extraordinary range of practical and challenging problems related to all functional areas and types of businesses, using real companies both US-based and international, continues to be a hallmark of Complete Business Statistics. As with previous editions a diverse set of computational problems is included. However, we have also added to this new edition a wide array of new, interpretive problems, using summary data, to teach not only how to do statistics but how to think statistically. They are designed to teach students when and how statistics can be applied in the business environment and how to interpret and act upon the statistical results, whether calculated by them or by someone else. Clarity is found in the quality of the explanation rather than the quantity of words used. Thus, in Complete Business Statistics, the goal has always been to be both as clear and as concise as possible. Available separately for adopters of Complete Business Statistics is a collection of Excel templates that allow for easy computation. Designed to free students from the task of developing formulas, it allows them to concentrate on the concepts behind the numbers rather than the mechanics of the calculating tool used. Non-platform specific, the templates can be used regardless of the operating system of their computer, and includes full instructions for using the template and the accompanying data sets.